Hot dogs go Mexican with these hot dogs that are topped with guacamole and salsa and wrapped in a flour tortilla. Dogs: Heat a griddle or grill over medium heat. Bring about ½-inch of water to a boil in a saucepan. Boil the hot dogs until heated through, about 4-5 minutes. Transfer the hot dogs to the grill and cook to crisp up the casings. Guacamole: Meanwhile, combine the onion with 1 teaspoon of salt and let the salt pull the liquid out of the onions. Combine the avocado, tomato, lime juice, chile and cilantro. Stir in the onions and any juice that has accumulated. Season to taste with salt and pepper. Assembly: Put some cheese down the center of each tortilla, leaving a ½-inch border around the edges of the tortilla. 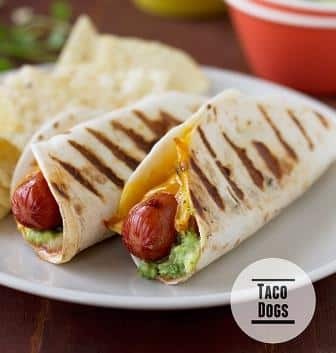 Place the hot dogs over the toppings, then top with the guacamole/salsa mixture, add some more cheese if needed and wrap the tortilla around the dogs. Use toothpicks to secure the tortillas if needed. Spray the griddle or pan with cooking spray or corn oil and grill for a few minutes on each side until brown and crisp. Try Vegetarian Hot Dogs or substitute corn for flour tortillas.